Plantar Fasciitis is a common condition that causes heel pain. This condition occurs when the long fibrous plantar fascia ligament along the bottom of the foot is inflamed or develops a tear in the tissue, resulting in debilitating pain. The plantar fascia ligament is made of fibrous bands of tissue and runs between the heel bone and your toes and stretches with every step. Inflammation develops when tears occur in the tissue, which is how Plantar Fasciitis develops. There are a number of plantar fasciitis causes. The plantar fascia ligament is like a rubber band and loosens and contracts with movement. It also absorbs significant weight and pressure. Among the most common is an overload of physical activity or exercise. 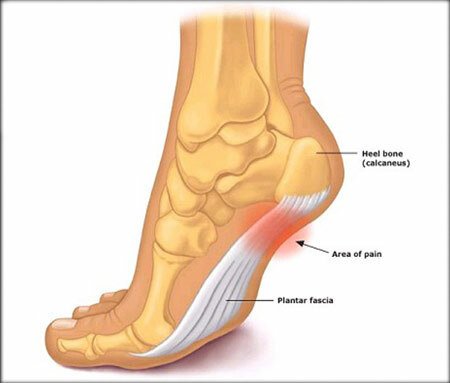 Athletes are particularly prone to plantar fasciitis because of exercise and extensive flexing of their plantar fascia. Excessive running, jumping, and other activities can easily place repetitive or excessive stress on the tissue and lead to tears and inflammation, resulting in moderate to severe pain. Among the most popular factors that contribute to plantar fasciitis is wearing incorrect shoes for a particular action or movement. In many cases, incorrect shoes do not properly provide support or cushion for a particular activity. Excessive standing and running and the loss of foot arch are a few of the most common reasons for the development of plantar fasciitis. Improved circulation that alleviates pain and muscle tightness and improves the healing process. The breakdown of chronic scar tissue and fibrosis resulting in improved range of motion that makes adjustments easier. Non-invasive procedure requiring no anesthesia or drugs and it has no side effects. Treatment success rates are the same or better than surgery, but they are never worse.